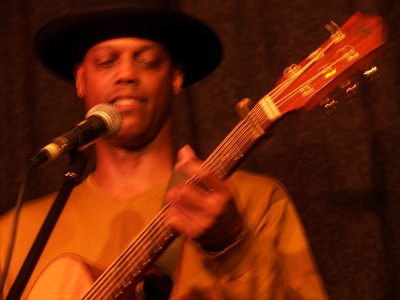 Eric Bibb is not your normal accoustic blues singer/songwriter. 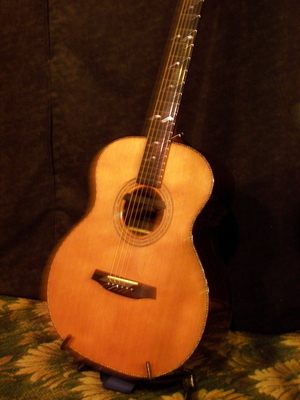 He writes love songs to his wife which are soaked in passion, fun and fidelity. He honors his parents…publicly. He takes the funky chords and rhythms of the blues, turns the lyrics on their head, and transforms them into sounds of grace and gratefulness. 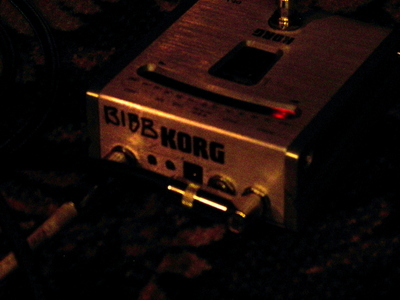 It is gospel-infused blues. We just spent a sparkling … magical … enchanted … perfect (as in “how could this be any better?”) evening with Eric Bibb. Unforgettable. That smile. Those chords. That voice. Those words. Our family discovered Eric Bibb last summer; in October we saw a few performances on Youtube. “If he ever comes within driving distance, we need to go see him,” said my non-concert-going husband. Well. One afternoon in December when I should have been writing Christmas cards, I decided on a whim to check Eric’s touring schedule. He was singing in Paris, Dublin, Cambridge, New York, Chicago, Montana …and Sandpoint, Idaho? 5 1/2 hours away, considered a Sunday drive in our parts. We didn’t count on one of the biggest snow storms in recent history, so the driving took considerably longer. 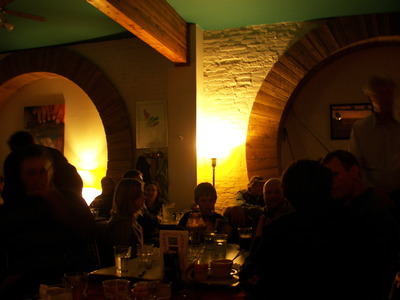 I told some friends and we booked a table for 15 at the café where he was playing. 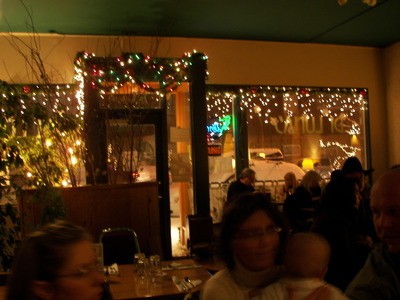 The small venue,space for 125 people, was glowing, soft lights inside, huge snow flakes outside. Long time fans, like the people at the table next to us who had flown up from California for the concert, and folks who had never heard of him joined together for a meal and music. When he took the stage, two arm lengths away from me, all the ambiance faded into the background and the music dominated. We were a responsive audience, calling out favorites, hooting at an amazing guitar riff, listening intently to the ballads and clapping with the thumpin’ songs. He was humbly delighted with our enthusiasm and promised to come back to Sandpoint. The kindness of the Lord was evident the entire trip. New water’s in the well, and I’m grateful for every drop. My son took a movie from our digital camera. The graphics are sub par but the sound is pretty good (*other than the fact that there is more audience noise…closer to the camera). Check it out. 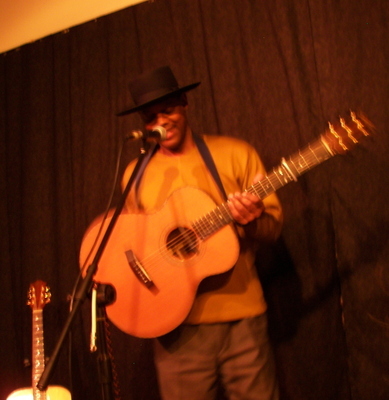 Eric’s newest CD “Evening With Eric Bibb” is his only live concert. If you like this song, get the CD. This entry was posted in Uncategorized and tagged ericbibb, music, mylife by alivingpencil. Bookmark the permalink. Very fun trip Mom. And its all thanks to a random urge for you to look at his site. God works in mysterious ways. On your recommendation, I will listen to some of his stuff….have to wait until I get home tho’…….. WOW!!! What an amazingly fun time that must have been. I think it would have seemed surreal to me to be sitting as close to him as you were! I’m so glad you all got this opportunity. Sounds like such fun! I will have to listen to the clip when my internet connection picks up enough to do so. Oh, and of course I found that book when I got home from church. So I still have it. Wow – I LOVED that! Huge thankyou for the tip!! Oh Lynne I’m glad you enjoy it. I like his newer stuff better than the older stuff: more acoustic and just Eric singing. Although I’d sure like to try one of the CD’s he made with his father, Leon Bibb. And the newest CD which came out in September, Evening with Eric Bibb, is hands down my favorite. Hi, I followed you back from Valerie’s site, but I think I’ve seen you at Carmon’s too. We’re in Oregon too. I love Sandpoint Idaho, it’s such a sweet little town. I’ve never heard of Eric Bibb, but I’ll have to look him up. That’s definitely my husband’s sort of music. Welcome, Kerri! Thanks for stopping by. Can you recommend a non-live album? I’m an iPod kinda gal, and concert recordings tend to be weird on shuffle. Diamond Days is a good one. But I have to say that I love the live album on my iPod. But I’m new to iPod. What do you mean “weird on shuffle”?